Manila, Philippines - An 8-year-old from Cavite was the third "The Voice Kids" contestant to turn all three chairs in the reality show's second part of premiere episode aired on Sunday, May 25, 2014. Nathan Bautista, who hails from Imus, sang a power ballad song of American rock band Journey "Don't Stop Believin'" in the second Blind Auditions episode of the ABS-CBN program, which reunited coaches Sarah Geronimo, Bamboo Manalac, and Lea Salonga. For the record this season, all three judges turned their chairs on Nathan’s first 5 words of the song lyrics. Bautista said that his father has influenced him. Coaches were very impressed and Geronimo even said he's 'halimaw' in singing. Nathan Bautista chose Bamboo Manalac as his mentor. Nathan's 'Don't Stop Believing' trended on Twitter Philippines as netizens were amazed on his performance. 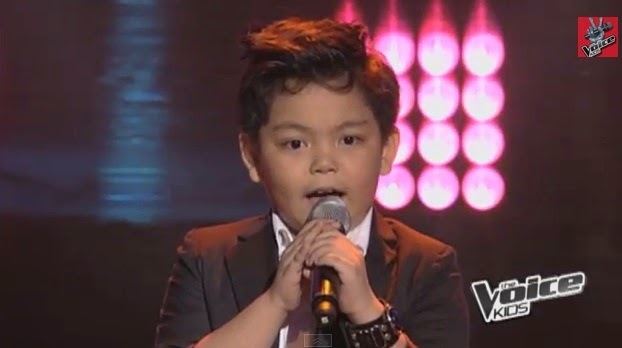 Nathan is also a contestant of Promil Pre-school i-Shine Talent Camp 2 aired on ABS-CBN last year and have won as one of top i-Shiners which have received P200,000. By the end of the Sunday's episode of "The Voice Kids," Salonga was not able to have additional artist on her team. Previous recruited young artists were Garcia, 11-year-old Koko Luy, and 9-year-old Darlene Vibares. Manalac is now leading with four artists on his team: Nathan Bautista, Zack Tabuldo, June Mark Armecin and Grazz Rodriquez. Meanwhile, Geronimo has two artists on her team namely: Lyca Gairanod and JM and JC Urquico. Don’t miss “The Voice Kids” this Saturday (May 24), 6:45 PM and on Sunday (May 25), 7:30 PM on ABS-CBN’s Yes Weekend.